Optimize Your Fluorescent Western Blocking and Washing Steps - Advansta Inc. Blocking and washing can make or break a Western. Insufficient blocking or washing can lead to high background and a low signal-to-noise ratio. Excessive blotting or washing can mask antibody-antigen interactions or wash away antigen. Detection reagents can also interact with different solutions interfering with your ability to visualize your target protein. 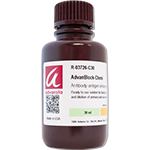 The best blocking and washing solutions depend on the antibody-antigen pair and should be optimized for each new set. Similar to chemiluminescent Westerns, you can use either a phosphate- or tris-buffered system for your blocking, incubation and washing solutions. But remember that phosphate can bind to some phospho-specific antibodies decreasing your ability to detect your protein of interest. 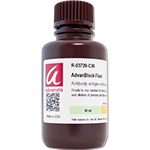 Tris-based solutions are generally a better choice for these antibodies. But not always! This is especially important to remember for fluorescent Westerns because they lend themselves so easily to quantifying post-translational modifications. Whichever you choose, keep it consistent throughout the experiment. Tween® 20 is often used in low concentrations in blocking buffers for chemiluminescent Westerns to improve blocking. But Tween® 20 can be autofluorescent and actually increase non-specific background when used in fluorescent Western blocking solutions. To use Tween® 20 in a fluorescent Western, leave it out of the blocking solution, but add it to the primary and secondary antibody incubation solutions, as well as the wash solutions. 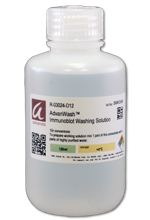 Use 0.1 – 0.2% for antibody solutions and 0.1% for washes. SDS is a harsh detergent that can interfere with antibody-antigen interactions, so too much can be a bad thing. But a little SDS can go a long in reducing background on PVDF membranes, especially in the 700 nm range. SDS should only be added to the secondary antibody incubation solution. Don’t try to sneak it in during blocking, washing or with the primary antibody. A concentration of 0.01-0.02% is sufficient. Note: SDS should never be used with nitrocellulose membranes. We’d all like to believe that there is consistency in a product when purchased from the same supplier, but this isn’t always true. 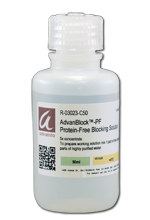 Here at Advansta, we have noticed that lot differences in PVDF membranes can result in higher background. If you are all of a sudden encountering background where you never did before, it might be due to a new batch of membrane. You might have to re-optimize your fluorescent Western blocking and washing solutions to decrease the background.